Long Beach Transit Passport, route C.
The Fresh Rhythm Big Band and Five Got Rhythm Combo are Millennial Jazz aficionados who are putting their "fresh spin" on the romantic and jazz standards of The Great American Songbook. Since they formed in Orange County at Chapman University in the year of 2015, they have become regulars at The Disneyland Resort, Herb Alpert's Vibrato Grill, The Cicada Club, Clifton's Republic, and the Segerstrom Performing Arts Center. They look forward to having their Five Piece Combo and Trio play each Sunday Brunch and help bring in the new year at the Queen Mary. 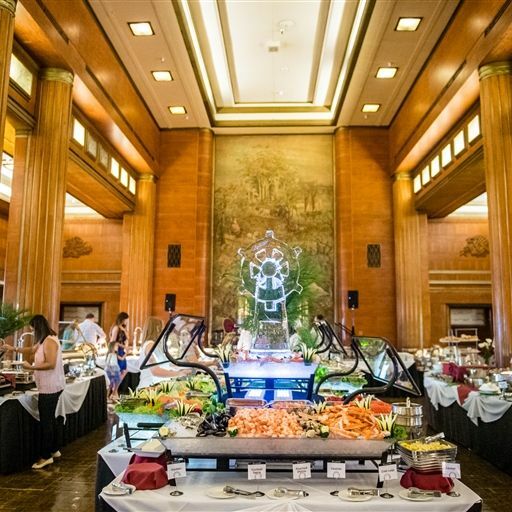 The Queen Mary’s award-winning culinary staff creates innovative banquet cuisine for groups from 10 to 5,000 and even offers event goers the unique experience of enjoying the maiden voyage meal. 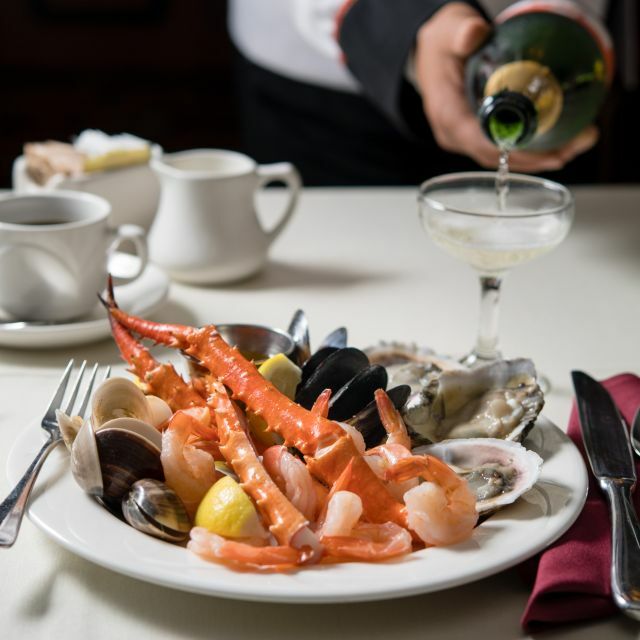 Our chef’s expertly recreate the meal that travelers ate in 1936 when the Queen Mary first set sail. 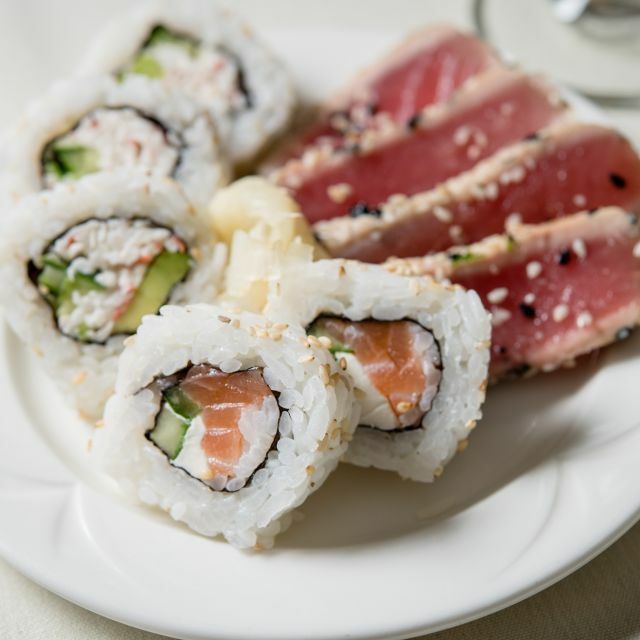 Take a culinary journey with world-class meals from all over the globe. 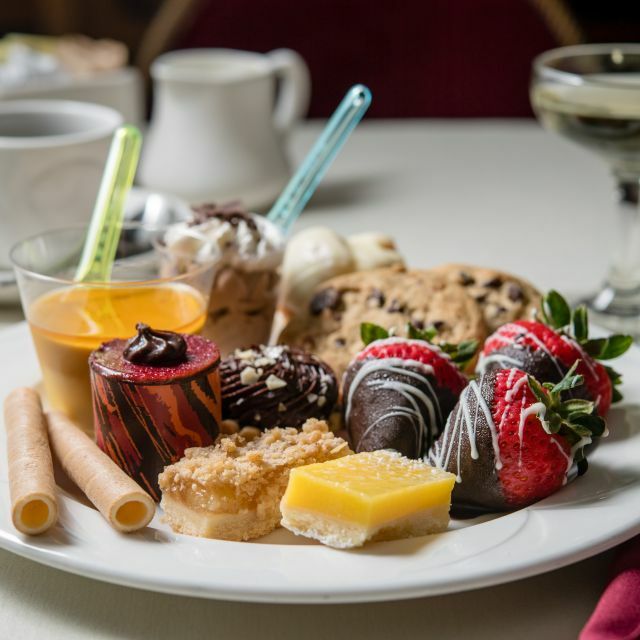 Even the most discerning epicureans will delight in our award-winning cuisine. Tried it for Easter - thought it would be worthwhile because of what others had said...such a serious let down...incredibly disappointed for how much we paid. To start, we had reservations, and still had to wait in line for 30minutes to even check in. The food was mediocre at best with no real flavor (e.g. chicken nuggets were used for sweet and sour chicken). There was a very limited variety for the different stations. My water was brought to the table and never refilled - it sat there for at least 40 minutes without even so much as a glance from the many many bus-people. Will never go again. Not at all worth it. This is a review of the Queen Mary Brunch on Easter Sunday. Thankfully we arrived 45min before our reservation. When we got to the check in...the line was LONG. We talked with people that had been in line and they said the the reservations was running 1.5hr behind the reservation times. UGGG. I started to call other places to see if we could get in at a late time. However; my group discovered the champagne bar while waiting in line. That being said...everyone was happy to be able to sip on champagne while waiting. And then the line started moving fast. We ended up being seated only 15min past our reservation time. 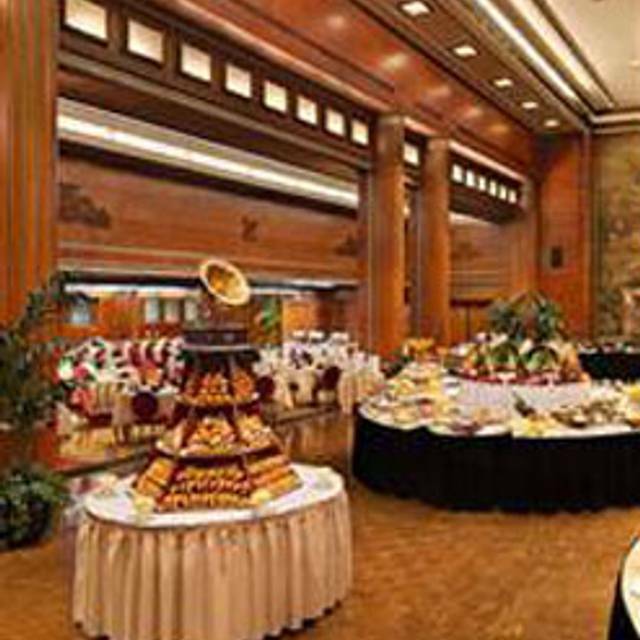 Inside the Grand Salon...food was plentiful and very well done. The Prime Rib was so tender and the Sushi bar was excellent. We will never go back on Easter or any other holiday, but everyone in my group wants to go on a regular Sunday Brunch on the Queen. Chaotic reservation process. We had to wait over an hour, even though we had a restaurant. I think they were short on wait-staff, because we barely had anyone come to our tables. Food was decent, but overall not worth the high price. All of this chaos may just have been because it was Easter, so keep that in mind. They oversold their reservations, and guests had to wait in a horrendous line. The food was clearly over mass produced in a way that lacked quality and flavor. The band ended at 2pm on a holiday while they were still charging $80 per head and serving till 5pm. Honestly, it felt like a lot of greed on the part of the restaurant. Such a shame as it’s such a lovely spot for it to go so wrong. We had reservations for 2:30p and had to wait for over an hour to be seated. Luckily they served champagne or we would have left. Some type of food should have been served. Allegedly all in line had reservations. So was it your fault or the Queen for not managing the hordes or better coordinating reservations? Clearly there were more folks then spots. We were told it was the busiest Easter brunch ever. Doubtful I wll ever return on Easter. Great Buffet! Fantastic 1930’s Decor!! I have been any times. When we went for X-mas, it was perfectly busy.! Meaning, we didn't have to wait more than 1 minutes. And, the staff was beautiful and totally on top of things. 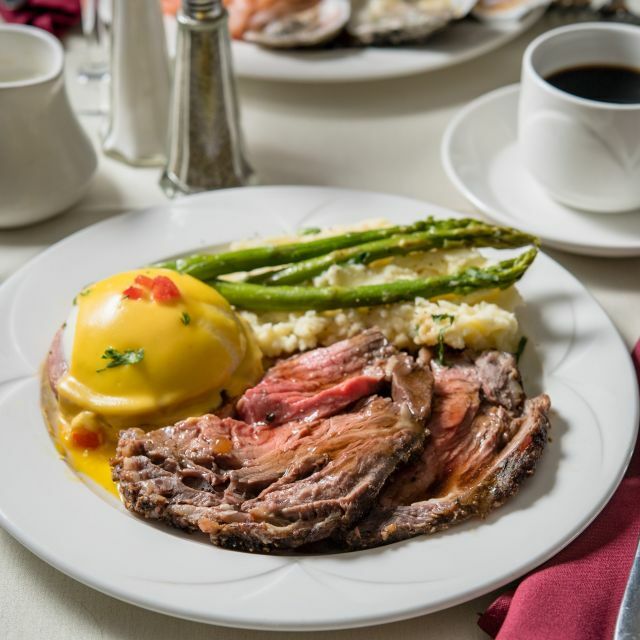 Be glad we didn't go to the front and INSIST on a hefty discount on THIS trip for EASTER, because there was NOT ONE SERVER or bus person at our table, until the 2nd plate that I had went for!!!!.. What A TOTAL let down!!. And, this was a very very special occasion. You have No Idea!.. We waited for our 1:30pm (reserved) table for well over 1 hour and 45 minutes, from starting to the seating!! Unbelievable!. The floor was a complete disaster!. The only thing that was great, is that the food kept coming out!. Thank God!. It had better!!. for $80 bucks a person!.. Okay, I said my peace!.. NO!!. I don't ever plan on coming back during the holiday - ever again, NOR am I going to refer anyone there, as well, for holiday visits. MAYBE for a regular Sunday Brunch, though. Bye for now!! We had a 1:30 reservation and it took 1 1/2 hours in a long line waiting with a toddler 😤🤦‍♀️. It was an overbooked experience that was more stressful than good. The food was ok. It was so crowded and everything felt rushed. They were short staffed and it was hard to get service. By the time I got food my toddler was so grumpy and it was hard to have a nice meal. I will not go back which is sad because I used to like their buffet. Even with our reservation we waited in line for 1 hour plus. It took 3 requests to get water and we had to fill up our champagne ourselves. They were really understaffed for an $80 brunch. It was definitely a bummer on Easter. Had made reservations for Easter Brunch, when we had arrived, surprised to see a line waiting to get in. We were told that they had over booked this brunch. As many groups that had reservations, we all were upset and disappointed. Asked if they would compensate for their error, I was ignored. After brunch, they had the nerve to even charge for parking and was told they discounted the parking fee. Never will we return or suggest the Queen Mary. We had a reservation for 1pm and didn't seated until 215pm! Easter Sunday you would think the management would step things up, but we found total chaos when we arrived. Lines of people waiting to get inside the hall who had reservations for earlier still waiting. Once we did get inside, there were empty tables everywhere! The line was still just as long. Food was plentiful and the waitstaff attentive. Absolute disaster. The line for people with reservations was an hour and a half wait to just check in. Spoke with a manager and he was unapologetic. People were very upset. They overbooked. The menu was much less in assortment this year from last year. My waiter inside was excellent, and the best part of the trip. We have gone for the past three years, but after this disaster, I doubt we will be back again. We had reservations and stood in line for over an hour! Had reservations for Easter Brunch, which was also my mother-in-law's birthday. Walked in and there was a huge line that snaked the entire floor of about 100 people. Asked the poor lady trying to calm everyone down at the front and she told us that it was the line for parties with reservations. However that was not accurate, we found out later when we finally got to the actual check-in that the new Director of Hospitality had oversold the brunch and cut back on staff. So the poor staff had abandoned the reservations and were seating people as they checked in and tracking via pen and paper. We waited in line for 1 hour and 28 minutes and spent $330 before tip and pretty much all the guests seemed upset, the staff was overwhelmed, some of the food was cold, and no one was abusing the entryway where they were giving everyone in line free champagne for the wait. My husband and I came once before and it was fine but this was embarrassing. I felt bad for bringing my mother-in-law and our other family. We won't be returning. We made reservations weeks in advance, on my to arrive and see they were accepting walk ins without giving any priority to those who had made a reservation. We were seated over an hour after our reservation time. The food was average at best and was made worse by the premium holiday pricing. O ah e to say we have made our last voyage on this past its prime ship! We went for brunch on Easter and had to wait in line for almost 1 hour even though we had reservations. The line was even longer when we left. They may have overbooked reservations. I'm not sure what the issue was because talking to other people, other Sundays were not an issue. For such a high end buffet this was not acceptable. They had lots of activities for the kids like an egg hunt which is why we decided to go. Once we were seated, we enjoyed our meal and there was a good variety of food. My daughter especially liked the ice cream bar that also served waffle cones and crepes. The food lines were not long and food was replenished quickly. However, they may have been understaffed in the dining room because it was a little slow when ordering drinks or getting the check. I waited 30 min to get hot tea. Hard to really judge a place when its a big holiday. We went on Easter Sunday and of course it was packed. I was actually impressed that the service was amazing and the buffet never ran out of food given the amount of people that were there. Food was great, ambiance was nostalgic of a time gone by and the entertainment was perfect. Everyone was very nice. Would absolutely go back and recommend to anyone looking for a unique brunch experience. Fantastic Easter brunch. Face painting and petting zoo as well!! New Director of Operations, and the changes for our Easter Brunch did not make us or other families very happy. We booked March 1st for brunch on April 21st. Waited 1 hour and 20 minutes for our reservation in a long line. Not sure what a reservation MEANT to the Queen Mary but our dad of 85 years had no place to sit nor did his girlfriend of 70. Standing and waiting was hard on the feet and back. Lots of elderly waiting in line which made me feel bad as well as angry. I am a former restaurant owner and on holidays we booked our tables for 2 hour intervals to give good service. Holidays are not a time to be greedy but extra special attention should be given. Last year we got sat with our reservation within 10 minutes. If it’s not broke...don’t fix it. Shame on management for not doing a good job when they have been doing brunch for this long. Thank goodness for our delightful server that took some of the bad taste off our initial experience and a big hand to the kitchen staff that really put out hot, great food for the masses. Sorry management you flunked on this one! I am glad for the live music, although, they jazz trio sounded as though they played the same song over and over the entire time I was there. Service was atrocious. Waiters could not be found for simple coffee refills. The buffet was a nice spread, but did NOT live up to the hype. 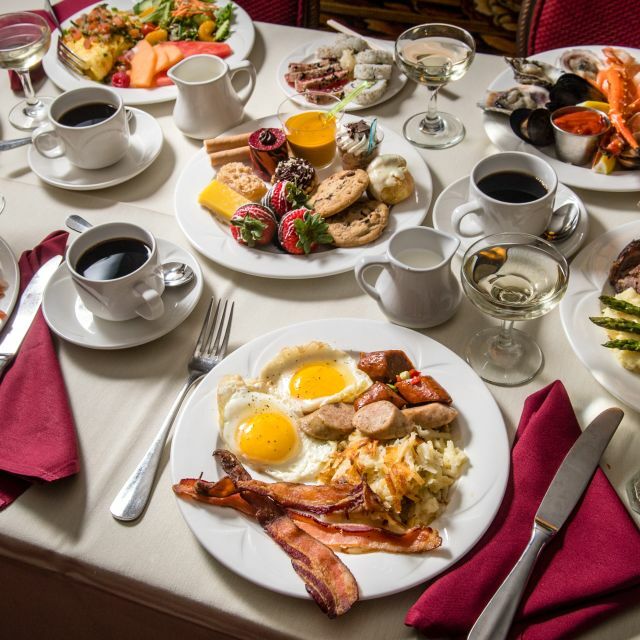 There are raves on-line about this particular brunch buffet, but I have had better elsewhere for a LOT less. Apparently, there was no dress code. Plenty of people there for Easter Brunch in their formal jeans, shorts and flip flops. At times, it was as if I were dining at Walmart. On the whole, it was "nice", but there was no WOW factor. No reason for me to return. I doubt I will. I suppose I was expecting a first rate, high end affair. Sadly it was not as special as I have read. HOWEVER.....The Afternoon Tea service aboard the Queen Mary was a much more enjoyable experience. I will return one day for that. Good service, nice place, beautiful view definetly recomended we had such a nice day with family!! 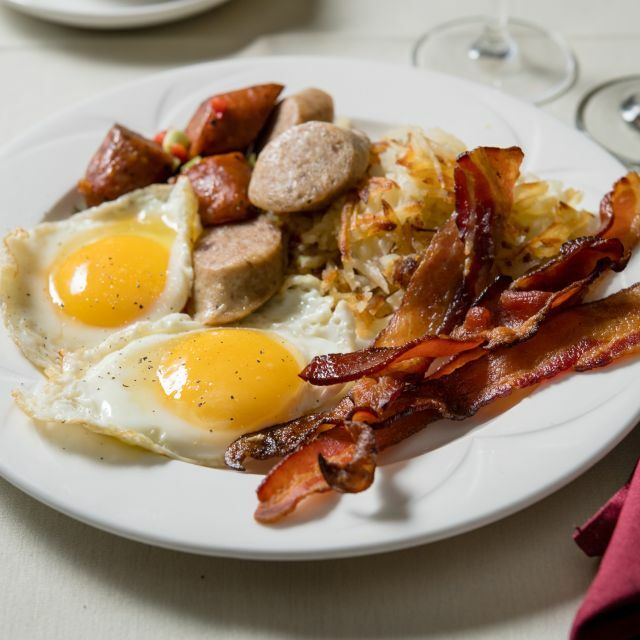 Easter Sunday Brunch is an annual event with the family. The live music is very nice, and there is a wide range of food offerings. Sadly, I did not see the pasta bar, as in previous years, but the rest of the food selection was excellent. VERY well staffed (both wait staff and food servers). Chaffing dishes are NEVER empty! I would HIGHLY recommend making reservations for EARLY in the morning, as the line to get in tends to get quite long (length and time). It seems they don't allocate enough time for the average party's use of a table - scheduling too many people at the same time. We arrived early for our 10:00am reservation and were seated right away. The service was EXCELLENT - free pouring of champagne, oj and coffee. The food was mediocre at best. The oysters were dry on the edges, the crab legs were small, and hard to get out of the shell, considering they were already split. There was a lot of food, but it was not of high quality. We were VERY disappointed at the price of $79.00 per person, and can find better value other places. When we left, about 11:30ish, the line was around the back of the ship, with close to 200 people waiting that HAD reservations. They overbooked the brunch terribly - We felt sorry for those with small children, having to stand in line for 2 hours - noticed on Yelp that some people just left and went elsewhere. We love the QM and have been there many times. We will not be going back for this brunch again. This place is so poorly managed. Some friends had gone the day before for some tours - they paid $40 a person and 1/2 of the exhibits were closed. They were not told this and felt totally ripped off. The QM needs to get it together FAST if they hope to keep in business. Easter was very crowded but a wonderful experience. Sometimes lines of people waiting for omelets/crepes/prime rib were so long they blocked access to the rest of the buffet. Had to ask for drink refills or find a server. They did however take empty plates very quickly. Food was very good with a great selection. Can't beat the ambiance of the great ship. Will definitely go again (maybe not on Easter). We were here for Easter brunch so I’m not sure if it is upgraded from the regular Sunday brunch but the food was Really great and there was a very wide selection. Service was really good, they kept the champagne flowing for our mimosas. Would definitely recommend it! It is a buffet so keep that in mind if you don’t like buffets. It has always been a pleasure to spend Easter at the Queen MARY. Great experience again. Great food, great experience, great service! Will definitely come back for special occasions! The room was beautiful and the food presentations were lovely. Would of liked to have seen more scratch made items. Sauces, whipped cream, clarified butter were from a mix. Oysters were frozen and not fresh, desserts looked better than they tasted. The staff was welcoming and friendly. Ariceli was a fantastic server! I would recommend to try the brunch experience at least once. Love it! Will be back soon. 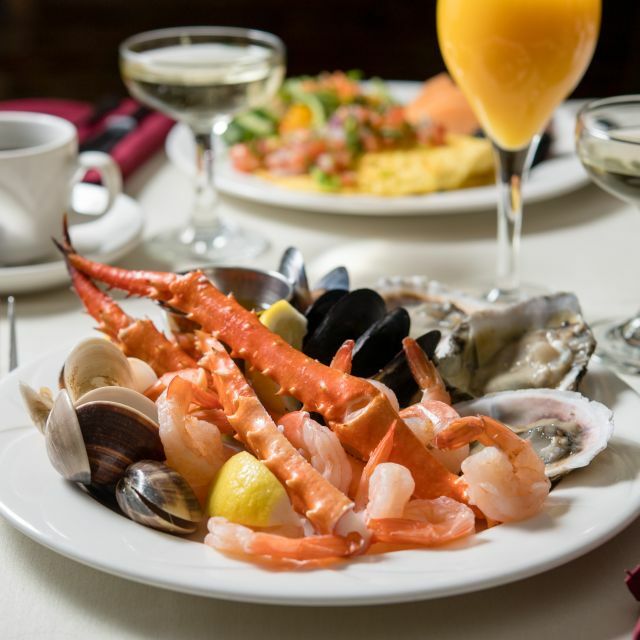 I used to LOVE your Sunday brunch, yet was quite disappointed to find out upon arrival that the price of your brunch has gone up upwards of 33%, which is an egregious increase, and will only further hinder customers from attending your Sunday brunch. Also, the waffles were cold, and they were the last time I was there as well. Still beautiful ambiance, though! However, I will not be returning until/unless the price is lowered drastically. Greed = less customers.